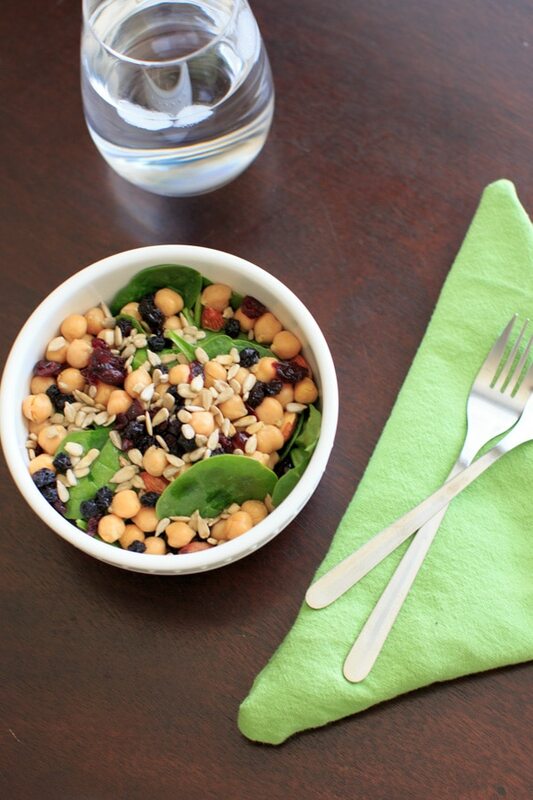 Spinach Chickpea Salad – a bowl of deliciousness! Protein, veggies, fruit, seeds, and nuts = flavor that will make you say goodbye to your normal boring salad. I have made this salad at least 20 times in the past couple months. Same as my previous favorite salad it features spinach and fruit but the star ingredient is chickpeas. As with most salads, you can go a lot of ways with this one. Greens and chickpeas are really the only two requirements, and then you can go crazy! Fruit! Nuts! Seeds! And if you really want to go crazy you can add kelp granules (it’s my new thing! Adds iodine and flavor, similar to salt but better for you). I’ve mixed it up with baby spinach / mixed greens, fresh fruit / dried fruit, slivered almonds/whole almonds,and even the occasional tomato. 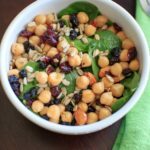 For this recipe, I’m listing my staples – baby spinach, chickpeas, sunflower seeds, almonds, dried blueberries and cranberries, lemon juice + olive oil. Who knew chickpeas were so delicious? Besides just using them for hummus, this is my new favorite way to eat them. The chickpeas fill you up more than just a regular ol’ salad and the more you fill up on the healthy stuff the better! Plus it’s colorful + crunchy, sweet + tangy, customizable + fun. Can you blame me for making this over and over? 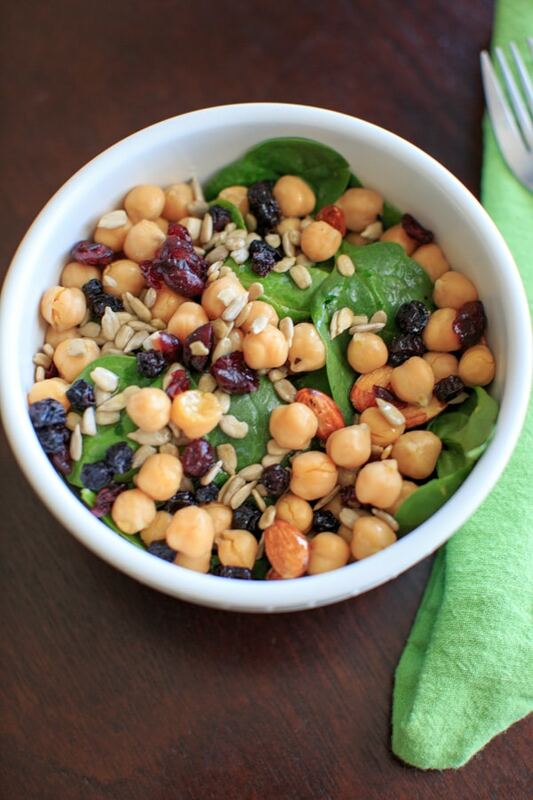 Have you ever added chickpeas to your salad? What’s your favorite way to eat them? 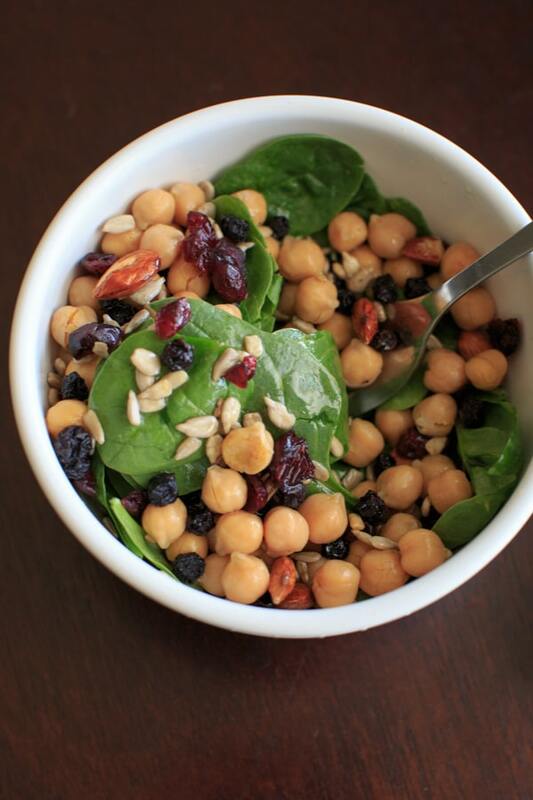 Spinach Chickpea Salad - a bowl of deliciousness! Protein, veggies, fruit, seeds, and nuts = flavor that will make you say goodbye to your normal boring salad. 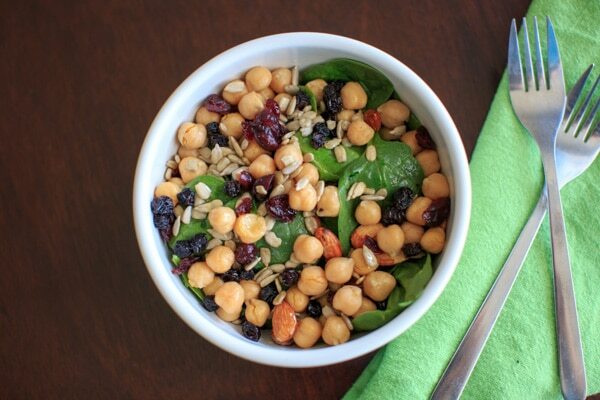 Toss together the spinach, chickpeas, dried fruit, sunflower seeds and almonds in a bowl. Top with olive oil and squeeze the lemon juice on, adjust measurements to taste. Measurements are approximate - I usually just throw stuff in so measurements are not necessary. Do what feels right!